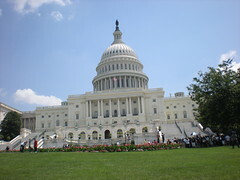 Wednesday, July 28th: Following a good nightâ€™s sleep after traveling from Vancouver, British Columbia, to Alexandria, Virginia, via Dallas, Texas (a route which still doesnâ€™t make sense to me) and armed with my printed Google map, I headed out to explore Washington, DC. 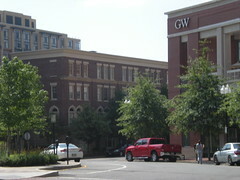 Finding my way from the Westin Alexandria to the MetroTrain station, I felt an affinity with the building with the initials â€œGWâ€. I felt greatness occurred within those red brick walls! 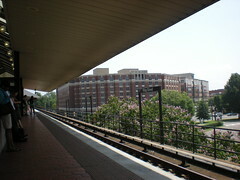 Taking the MetroTrain into DC was very easy; like taking our SkyTrain. Everything I encountered along the train trip was adequately accessible. And it was only six stops â€“ a short half hour â€“ to the starting point of my solo DC tour. Waiting on the train platform, I was take by all of the red brick. The view awestruck this one from the west coast! 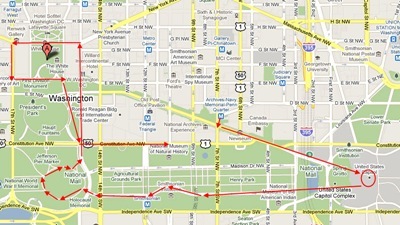 Not until I was on the train and it stopped at the Pentagon Station did I realize I was so close to the Pentagon. Had that realization struck sooner, I may have planned to include a quick stop there too. Walking along Constitution Avenue, I was drawn to a poster with familiar colours – the colours of Olympic and Paralympic Winter Games in Vancouver. It was comforting seeing a piece of home while being so far away. 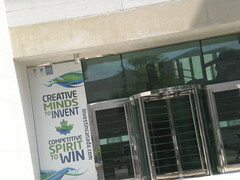 I later realized it was the Canadian Embassy. Coming to Capitol Hill, I was a little surprised to find only stairs flanking both side of the Spring Grotto Park. A security person said I could cut along the grass, which I did and shot this photo of the Capitol Building. I then found my way around the entire building, taking more photos. 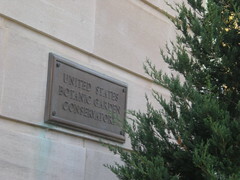 Needing a break from the heat, I popped into the United States Botanic Garden Conservatory for a quick wheel through. With so many museums and attractions in DC, I wondered if the First Family is able to get out to experience it without a major process being required. 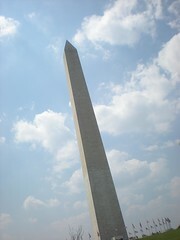 Continuing along, the next point of interest was the iconic Washington Monument. After seeing it countless times on television and in movies, seeing it close-up was amazing. I hadnâ€™t realize one could take a tour inside. 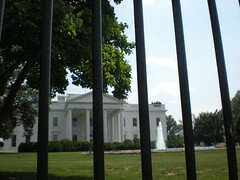 My final yet most awaited point of interest was the White House, of course! I was confused by my Google Map because it showed what I thought was the White House as the National Security Council and the White House was behind trees, out of sight. 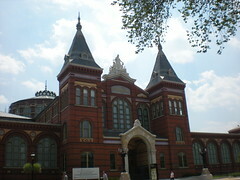 I later learned that the building was, indeed, the White House! And, not to believe everything on Google Maps! Peering through the fence, I couldnâ€™t help wonder who was being watched more: the people on the inside or those of us on the outside. Security was everywhere! I then rushed back to the American History Museum for 4pm to meet the wheelchair taxi that the conference organizer kindly arranged for me. Many more photos on my Flickr photostream! I can’t help you on your other 2 questions – I’ve only been to DC twice myself. I very much enjoyed seeing your photos and reading your perspective as a Canadian. Thank you! We took Isaac to Washington DC when he was little and were surprised how easy it was to get around on the metro with his wheelchair. Also, the guy at the Carousal said he could ride for free as many times as he wanted all day! Washington rocks!